The St. Louis Heroin Epidemic: Who Is Addicted And Where Is It Coming From? A man shooting heroin. 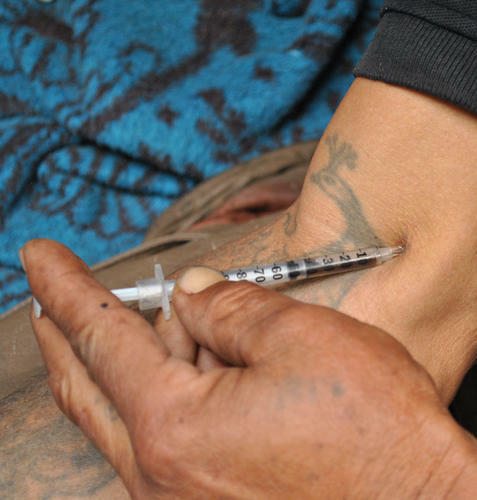 Now that heroin is available in powder form, injecting heroin is less common. St. Louis has a heroin problem. And the problem is growing, especially among suburban youth. As previously reported by St. Louis Public Radio, the number of deaths in Missouri caused by heroin has doubled in recent years, with 90 percent of those deaths occurring in St. Louis. According to Dan Duncan, the associate executive director of the National Council on Alcoholism and Drug Abuse – St. Louis Area, heroin use has been on the rise in the St. Louis region for a decade, both in Illinois and Missouri. Since Duncan's organization began keeping track six and a half years ago, 1900 people in the St. Louis region have died of drug-related causes. A discussion about the issue of heroin addiction in St. Louis and a documentary examining the path heroin takes from Mexico to Chicago to wind up in the hands of willing buyers in the Midwest. Because drug cartels use Chicago as a hub, most heroin comes to St. Louis by way of Chicago, said St. Louis County Police Sergeant Mark Whitson with the Drug Enforcement Agency Collaborative Task Force. 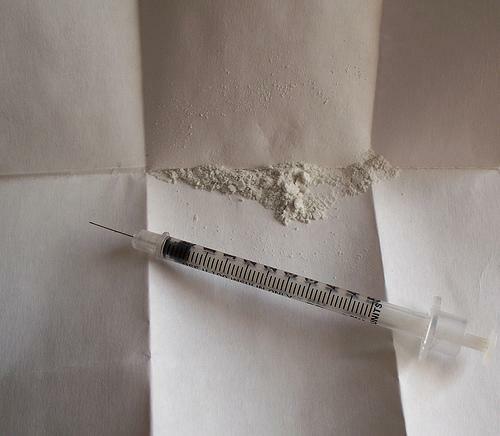 In December Chicago public radio station WBEZ produced a series of reports in partnership with the Chicago Reader investigating the business of heroin. A story based on these reports is featured in the second installment of the documentary series REVEAL which will air Tuesday at 7:00 p.m. on St. Louis Public Radio. “We wanted to look at the pathways from Mexico to Chicago, Chicago neighborhoods to the suburbs, and then how that heroin goes out to the rest of the Midwest, including places like St. Louis,” WBEZ reporter Natalie Moore said. In the course of her reporting, Moore was surprised to find out that not only were suburban youth the primary buyers of the drug, but that suburban houses were functioning as mini-warehouses. 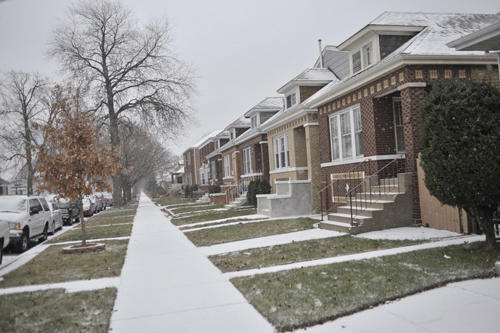 A block on the southwest side of Chicago where a stash house bust occurred. “These stash houses are not where people are going to knock on the door and buy drugs. These are bungalows on quiet streets that are warehousing tens of millions of dollars and tens of millions of dollars’ worth of drugs,” Moore said. Despite what Whitson described as a gauntlet of officers working from the Mexican border all the way through Chicago to St. Louis and back to Mexico, most of the drugs and money stay out of the hands of law enforcement. “We probably seize 10 percent of the money,” Whitson said. “The rest of it gets across the border.” Even so, the money they do seize ranges in the billions of dollars. “It’s a numbers game too, and what [the drug cartels] do is they just flood the country. And losing a load is part of doing business for them,” Whitson added. 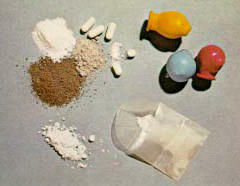 Heroin in powder and pill forms. Heroin has become popular again for two reasons, said Moore, Duncan and Whitson. First of all, heroin is now cheaper and available in powder form, removing the barrier of fear caused by needles. And simultaneously, the availability of prescription drugs has been reduced. “So the fear factor is reduced, the price point certainly helped, the availability is an issue, all those things combined at a point in time where, in my opinion … I think we are suffering from the laxity of our approach towards drugs,” Duncan said. And because heroin is so addictive and the withdrawal symptoms are so severe, once they’ve tried heroin it is very difficult to stop, he added. For people seeking drug counseling or family support groups, Whitson recommended contacting Duncan's organization, the National Council on Alcoholism and Drug Abuse – St. Louis Area at (314) 962-3456. St. Louis on the Air provides discussion about issues and concerns facing the St. Louis area. The show is produced by Mary Edwards and Alex Heuer and hosted by veteran journalist Don Marsh. The top two law enforcement officials in Madison County, Ill., say they want to hear from anyone and everyone who might have ideas about slowing the heroin epidemic in the county. Experts who study drug trends say the presumed fatal heroin overdose of actor Philip Seymour Hoffman shines the spotlight anew on the need for society to come to grips with widespread heroin abuse across the nation and in St. Louis. Among those who have studied the issue is Theodore “Ted” Cicero, a professor in neuropharmacology in psychiatry at Washington University Medical School. He has tracked patient trends in 150 drug treatment facilities nationwide for more than seven years. The number of heroin deaths in St. Louis County has decreased in recent months when compared to recent years, however, use of and addiction to the drug in the St. Louis area has grown to epidemic proportions.